Gamblin offers a great range of contemporary mediums. Using today's safer materials, they recreate the properties of traditional mediums. 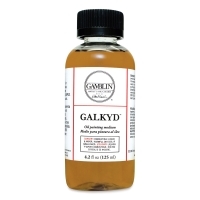 Galkyd Medium — An alkyd resin painting medium that increases the fluidity of oil colors and speeds their drying time (thin layers will dry within 24 hours). 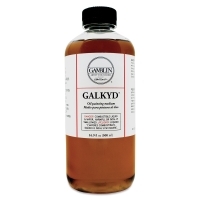 Its viscosity is similar to traditional painting mediums made from linseed stand oil. It levels brush strokes, creates a strong flexible paint film, and leaves an enamel-like glossy finish. 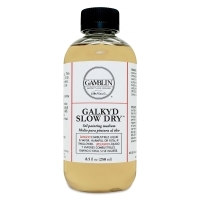 Galkyd Slow Drying — Formulated for strength and flexibility, and to keep the surface of oil paintings open for approximately three days — a good choice for painters who blend or work wet into wet. Galkyd Lite — Formulated to thin oil colors and maintain strong flexible paint films, with a viscosity similar to that of a traditional dammar/refined linseed oil/turpentine painting medium. It will leave brush strokes in thicker layers and allow a longer working time (approximately three hours). Glazes are slightly less glossy than those made with traditional mediums or Galkyd.